The Seoul Metropolitan Government said Friday that it had issued each member of the Seoul Blockchain Governance Team a letter of appointment using ICON, a public blockchain network. Seoul City has been operating the team with the aim of unveiling blockchain-based administrative services in various fields since the beginning of the year in line with its plan to “make Seoul a blockchain hub” announced last October. 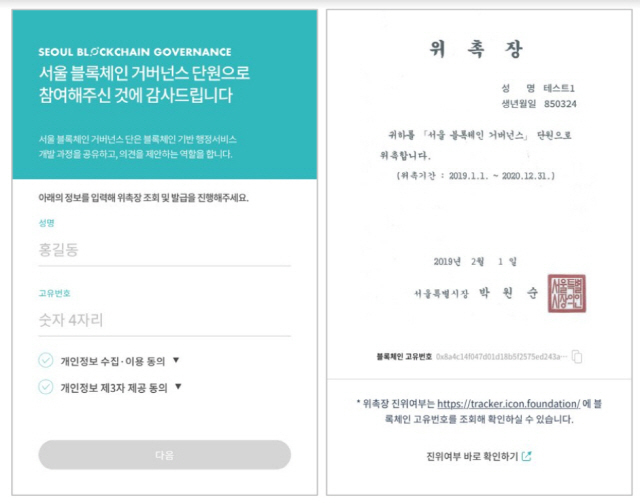 The Seoul Blockchain Governance Team, consisting of 100 citizens like university students, developers and entrepreneurs, is to take part in the test operation of blockchain-based public services and give feedback and make suggestions for two years from January this year through December 2020. Specifically, the team will participate in Seoul City’s development process of such administrative services as integrated mileage management, expansion of Seoul citizenship cards, paperless online verifications, protection of part-time workers and automatic payments of subcontract fees. Korea’s blockchain development company ICON Loop issued the letter of appointment through its ICON platform. Members of the team can check the appointment letter with their mobile phones. Each member can receive the letter of appointment containing his or her name, unique number and action period after giving consents to the clauses of collecting and using personal information and supplying it to third parties. The history of having issued the letter will be recorded on the ICON public blockchain to make it impossible to tamper and issue it falsely and it’s possible to verify its authenticity by checking the blockchain unique number in the ICON tracker. The ICON tracker is a browsing system to provide all transaction records on the ICON network to help ensure transparency and confidence.